Whenever I get frustrated about sexism and “glass” ceilings these days in the United States, I always try to take a breath and think about how things were just 50 years ago. That is the period chronicled in the documentary “Rise,” which looks at the lives of those who died in a 1961 plane crash that killed the entire United States Figure Skating team’s travelling party on its way to the World Championships in Prague. The woman who was considered a matriarch of the sport at that time, Maribel Vinson Owen, perished in the accident along with her two national-champion daughters. The film does a very good job portraying that family’s dynamics, and the struggles that Vinson Owen had as a working woman with great ambition and drive at a time when those qualities were discouraged in females. She was born in 1911, so she was a young adult in the 1930s, when the Great Depression still hovered over the nation, and into 1940s, when World War II’s demand for soldiers meant American women moved in unprecedented numbers into jobs that previously were almost always the domain of men. By the 1950s, Vinson Owen’s against-the-grain personality was firmly established, and she had two children to support after her ex-husband’s death. The 1950s backlash against the gains women had made in all endeavors had somewhat less of an effect on Vinson Owen, I would theorize, because she was already who she was. But what about women who were a generation younger than her and came of age in the 1950s and early ‘60s? The coastline in Wilmington, Calif., is quite different than the beautiful, languid beaches just to the north or south in greater Los Angeles. This is an industrial area, one of refineries, docks, cargo and backaches. This is business, not pleasure. When Phineus Banning helped settled the area in the mid-1800s, he named it after his hometown in Delaware and helped develop one of the largest and busiest seaports in the world. Nearby are his family home _ a small oasis _ and a high school named after him. A few miles east in Long Beach is McHelen Avenue, from where you can’t see the ugly, endless jungle of pipes, tanks and gigantic crates that clog the shore. On McHelen, you’re in a neatly kept, working-class Southern California neighborhood with stucco-finished homes dating back to the ’30s and ’40s and painted a variety of colors. The home at 21808 McHelen is tan, and you can imagine that once, there was an energetic little girl running around inside this house, getting into everything, exhausting her mother. Or, at least I can imagine this because of what I’d been told about Rhode Lee Michelson from the people who knew her, all of whom seem to have exceptionally vivid memories of her. She would grow up to go to Banning High School, but she wouldn’t finish there. Her life would end during her senior year. It was January in Greensboro, N.C. _ and a mecca of figure skating this is not. The most important sport in this city is ACC basketball, and that’s what often has filled the Greensboro Coliseum. Still, a decent-sized crowd came to stay late on a school night, a Thursday, to see the women’s short program of the U.S. Figure Skating Championships. Later, as I walked to my car while appreciating weather that felt comparatively warm, my mind traveled back in time. It was quite cold in Colorado Springs that January night 50 years ago when a group of talented people unknowingly sealed their tragic fate by performing well in competition. The skaters who competed at figure skating’s national championships back then had no notion of a “short” program – it didn’t exist as part of competition until 1973 – and, of course, wouldn’t have been able to conceive of Twitter. How about professional skaters being eligible for the Olympics? Women skaters routinely doing triple-triple combinations? A complex, points-accumulating scoring system no longer based on 6.0s? All would be in the future _ something the top skaters at the 1961 nationals didn’t have much of left. No other U.S. sport has been so irrevocably changed by a few horrifying, heartbreaking minutes. That’s how long it took for the plane’s loss of control while attempting to land, its subsequent plunge, the impact and the explosion. 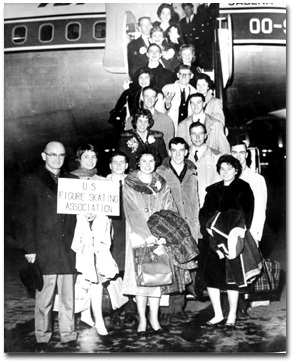 At 10:05 a.m. on Feb. 15, 1961, the 18 members of the U.S. figure skating team _ en route to the World Championships in Prague, Czechoslovakia _ died when a Sabena 707 jet crashed in a field near the airport in Brussels, Belgium. Also killed were 16 relatives, officials and coaches accompanying them. In the old “Star Trek” series, there was an episode called “A Taste of Armageddon” in which the Enterprise’s crew visits a planet that engages in “computer-simulated” warfare with another planet. Each simulated attack results in a certain number of “casualties” on each side, and people are then informed they had been “killed.” Alas, with a heavy sigh, they dutifully report to disintegration booths and are executed. The citizenry of both planets have agreed to this rather than “real” war, relieving the financial burden of rebuilding all that is destroyed by bombs, tanks, guns, etc. Plus, this kind of “war” is much better for the environment. You might say it’s folly to read too much into the first weekend of Big 12 play … except for the fact that if you’re a fan of certain teams, it’s probably very hard not to do that. Getting off on the wrong foot in the league shouldn’t necessarily be that big of a deal, considering how much can happen through the course of the season. However, there are some fans that are very hungry – ravenous, in fact – for a chance to believe that things are going to be different this time, that there is good reason to have their hopes up. And Saturday, the two groups of followers who likely feel the most acute sense of desperation right now saw their teams face off in a conference opener that may be a harbinger: Did we see the start of “Well, here we go again,” for Kansas and “We’re going back to the Dance” for Texas Tech? Over the Christmas weekend, I wrote a long, long entry reflecting more on the whole UConn streak/UCLA streak topic … but realized (after writing it) that I’m very weary of that particular “debate” right now, and that you might be, too. So I put that entry on the shelf. I may decide to post it later, or maybe it’s one of those blog entries that just never sees the light of day. (It would hardly be the first.) For now, let’s just move on completely from the Bruins and their record streak for men’s basketball, and instead talk about the next few days and where the spotlight will be for women’s hoops.